Whew! Absolutely shattered, but exhilarated that the Jam on Saturday was a success and went as smoothly as it could have done. 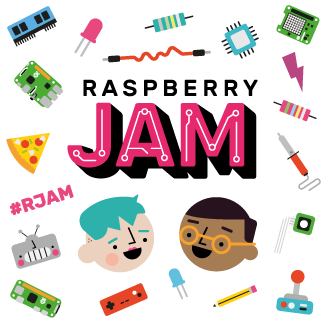 I decided to write this account and create a ‘virtual Jam’ out of the day. Many thanks to Matt Hawkins & Leo White for photos and Andy Batey for sorting out and uploading the videos onto YouTube. Thanks also to John Alexander for recording the Ciseco kit demo workshop! Tim Richardson and I arrived at the Institute of Astronomy at 10.30am and met Andy in the Foyer. Andy works at the Institute, got us the venue and has been an absolute star about everything – including wrangling us some last-minute tables and a trolley to transport them with, not to mention sorting out live streaming so that over 500 individual people were able to join us virtually! We set about laying out the Marketplace and the Show-and-Tell areas and were soon joined by our valiant marshals and also the caterer, Crazy Cow Catering (who we were very pleased to have join us – thanks Theresa!!!). Little by little, the place took shape and when the vendors arrived we had all their tables ready. I erected a front-desk exhibition stand… which convinced me that next time I want one easier to put up… and sorted out the registration desk with registration badges and paperwork. Our presenters and show-and-tellers arrived next and we set about accommodating them in the lecture theatre and on the mezzanine levels respectively. Soon after, people started to arrive for registration and pretty soon the room was starting to buzz with plenty of Pi-related chatter. Out of 120 people registering, 110 turned up which is a very good percentage. We realised afterwards that we could have fitted in more people, but you live and learn! We had a bit of a mammoth session planned to start with. Lesson learned – next time we make the sessions shorter! First of all, I gave an introduction… Now, I’m not much of a public speaker, so be forewarned! Next up was Alex Eames from RasPi.tv. 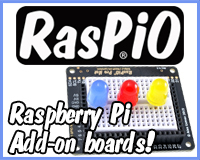 He has been developing a board called the RasPiO which plugs into the GPIO and gives you all kinds of connection possibilities including much-needed analog inputs via a chip on the board. As with most tech demos, this one went slightly awry but it was entertaining as anything and included some much-needed audience participation. Next up (I told you it was a mammoth session!) we had the indefatigable Jim Darby who at the last Jam thrilled us all with his Arduinos and strings of lights. This time he gave a basic talk on using the GPIO pins and doing simple things with them. 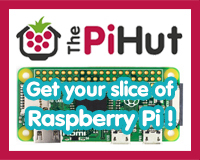 Myself and Tim were presented with customised cases by The Pi Hut. I don’t have a picture to hand, but suffice to say they are things of beauty – brilliantly made wooden Pi cases with Raspberry Jam and CamJam and today’s date on them. Really lovely! With our bladders fit to burst, I called an end to the first session. People also were then free to use the Marketplace. Tim had come up with the idea of having a PayPal kiosk that people could use as most of the vendors couldn’t take card payment. This seemed to go down well, although sometimes the speed of the kiosk and the fact we only had one caused a queue to form. It ran from a Pi though! We also had some show-and-tell going on with projects people had brought in, but more on that later. And that was it for the presentations, though there was still another break session to go. 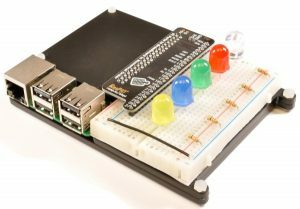 Raspberry Pi-controlled train set by the Raspberry Pi Guy! Big Traks galore from Leo White. The final picture is of Daniel Bull‘s Astro Blaster console. Daniel painstakingly restored and rebuilt this console which uses a Raspberry Pi emulator to let you play games from waaaay back like Space Invaders, Asteroids, that kind of thing. Daniel won the Best-in-Show prize for his efforts. He’d previously exhibited this project at the Milton Keynes Raspberry Jam and wrote a full account of the restoration and development on their forum. Read all about it here. 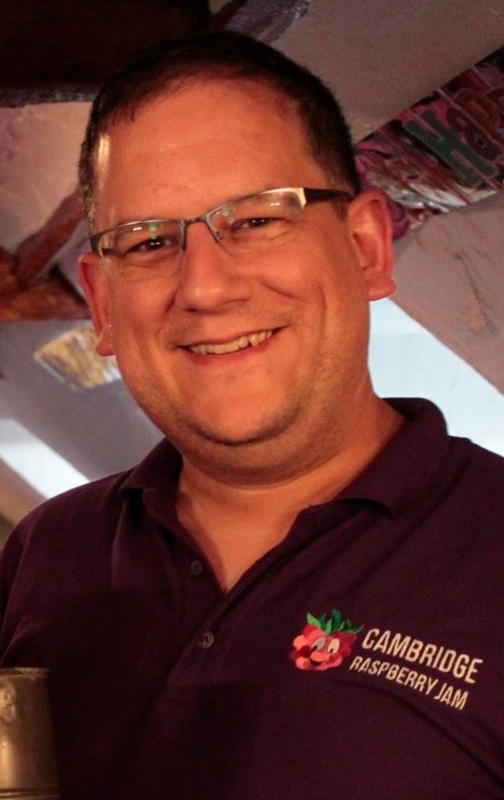 We’d like to extend our thanks to Alex Eames of RasPi.tv for being our judge on the day. The competition for best idea has been handed over to the Cyntech guys for judging and we hope to hear who the winner is in the next week or so. Myself and Tim really enjoyed organising the Jam and we’re planning the next one to be either in November or early December. I’m in a theatre show at the end of November so it might be better to wait until after that, maybe… I dunno yet! And we still need to confirm the venue, although I’d love to have it at the Institute again. 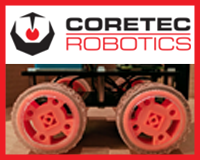 The big news for next time, though, is that thanks to some sponsorship we are going to be running some programming and tinkering workshops for kids. We’ve been working towards that goal, getting support from adults and sorting out the sponsorship, and I’m pleased that it’s only taken a relatively short time to get to this point. 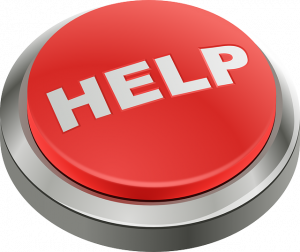 We hope to get great support from the Pi community, especially those who are used to dealing with kids and can help us do the teaching side of things. So, if you’ve got a child (or you are one!) and you want to learn to program and tinker with the Pi, let me know! Also, if you’re willing to help on the day, or have any advice, please contact me – you can comment below, contact me using the link in the menu or tweet me @recantha! It was an excellent Jam Mike. Almost perfect. Well done and thanks to you, Tim, Andy and everyone else who helped, spoke, exhibited and attended. Thanks for the Great jam everyone. Looking forward to Nov / December one! Totally agree with Alex. It was an awesome event. A big thanks to everyone who helped make it what it was!